Thousands of people demonstrated in Madrid on Sunday against Spanish Prime Minister Pedro Sanchez's proposed talks to ease political tensions in Catalonia, in a protest organized by center-right and far-right opposition parties. 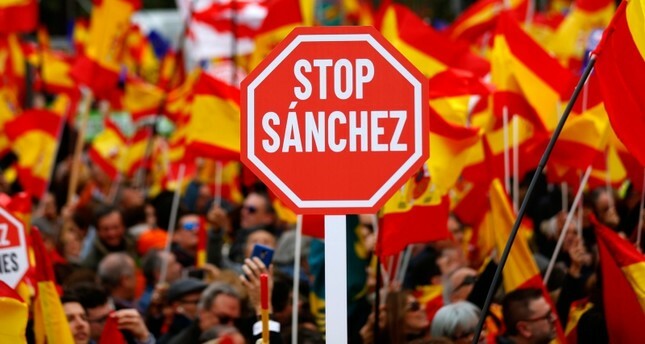 Demonstrators waving Spanish flags filled the Plaza de Colon in the city canter in the largest protest Sanchez has faced, with their slogan "For a united Spain, elections now!" a reminder of the pressure on his minority government. The Socialist government's proposal last Tuesday to appoint a rapporteur in talks among political parties to address the Catalan independence crisis galvanized the opposition, which has deemed it a betrayal and a surrender to pressure from Catalan separatists. The opposition has called for early elections. Sanchez said on Saturday that the gathering would show a "Spain in black and white that simply proposes to go backwards." The government is squeezed on both sides of the Catalan issue: Deputy Prime Minister Carmen Calvo said on Friday talks were on track to fail because Catalan pro-independence groups had rejected the government's proposed framework. The Catalan groups want a referendum on independence included on the agenda, which Madrid will not accept.